Unfortunately it took the public a few more years to become aware of these kinds of movie-making tricks. 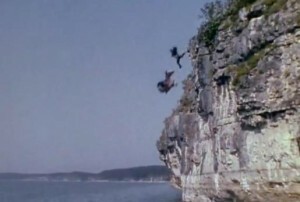 The film Jesse James (1939) starring Tyrone Power resulted in the death of two horses that were ridden over a cliff so the director could capture their spectacular falls. The following year the film Northwest Mounted Police had two horses die on set. 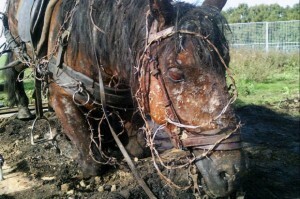 The movie-going public protested the horses’ deaths in those films, resulting in the creation of the first guidelines for protecting performing animals. 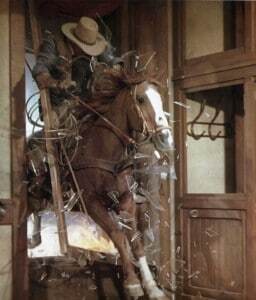 The scene in Jesse James (1939) that caused audiences to demand better treatment of movie horses. This horse was ridden off a 70-foot cliff and broke its neck in the fall. A second horse followed and suffered the same fate. The American Humane Assocation (AHA) was founded in 1877 when delegates from 27 animal-protection societies from around the country met to address inhumane farm conditions. A few years later the organization added the welfare of children to its mission and in 1921 lobbied to protect child actors. After the 1940 public outcry against the mistreatment of horses on movie sets, the AHA worked with the Motion Picture Producers and Distributors Association, now called the Motion Picture Association of America, to establish protections for animals on film and put AHA monitors on movie sets. 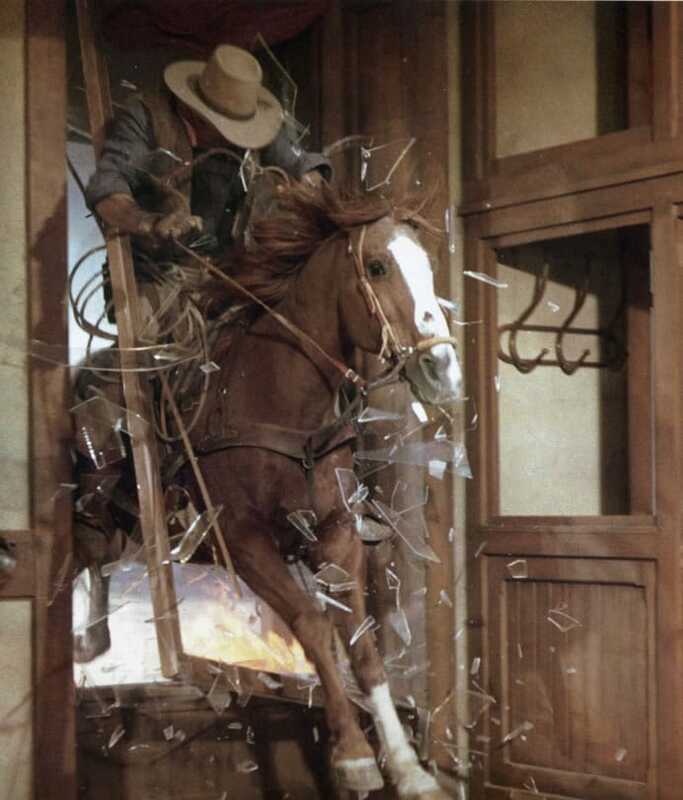 While directors often felt their creativity was inhibited by having AHA representatives on set, stuntmen and horses both benefited because it was much safer for a stuntman to perform on a horse that was trained to do tricks. The Hollywood “falling horse” was in demand for its ability to learn stunts quickly and perform them dramatically. Since it could take a year or more to train a good falling horse, the best horses often appeared in many films. Coco, a stunt mare owned and trained by Jack Williams, was known for her signature pirouette when taken into a fall. Because of her talents, Coco made movies for 20 years — but the long career didn’t leave her broken like many human stunt performers. She retired on Williams’ ranch and lived well into her 30s. Trained stunt horses were often painted different colors to portray various roles, sometimes in the same film. According to Hollywood Hoofbeats by Petrine Day Mitchum, the chestnut gelding Cocaine was painted black for the film The Wonderful Country (1959) and with varying white patterns when depicting several Comanche Indian ponies in the Ronald Reagan film The Last Outpost (1951). 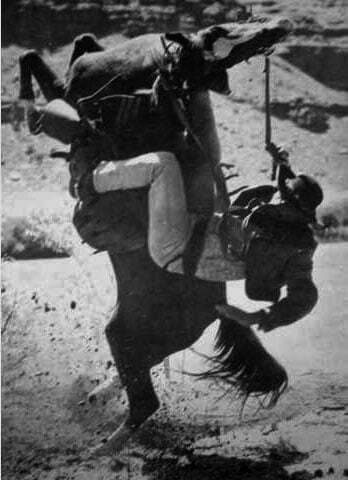 Cocaine lived to be nearly 32 years old and earned an American Humane Association Craven Award for Best Stunt Horse for his role in the John Wayne flick Hondo (1953). Unfortunately the codes established to protect animals on film were made voluntary in 1966 and horses’ lives were at risk on the set again. Directors could keep AHA representatives from monitoring animal safety during production. In 1969’s The Wild Bunch, stuntmen prepared for a dangerous scene where five horses and riders fell into a river after the bridge they were on exploded and collapsed. Because of the stunt riders’ professionalism, everyone made it through the scene without injury. The famous bridge explosion scene from The Wild Bunch (1969). All five horses and riders were uninjured. 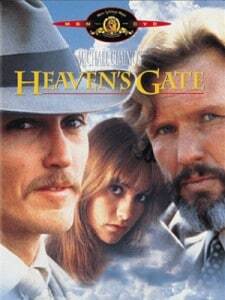 The disregard for animal welfare on the set of Heaven's Gate prompted stricter safety standards in the film industry. Flicka did not earn the No Animals Were Harmed statement after two horses died on set. The AHA determined the deaths were unpreventable. Today, when a movie featuring animals is monitored and approved by the AHA it’s given the right to use the trademarked phrase “No Animals Were Harmed” in the end credits. But having AHA representatives on-set doesn’t guarantee the safety of all animal performers. The 2006 film Flicka had two horse deaths during production, which were investigated by the American Humane Association and determined to be unpreventable accidents. The Los Angeles Department of Animal Services conducted its own investigation into one of the deaths and agreed with the AHA. As a result, the film could only put the statement “The American Humane Association monitored the animal action” in the end credits. Because of technology advances in filmmaking, the AHA encourages directors to use computer-generated images or mechanical “animal substitutes” in any scene where an animal might be at risk of injury. A scene like the bridge explosion in The Wild Bunch would be shot much differently today. Steven Spielberg’s War Horse (2011) is a good example of how mechanical and digital horses are used to create convincing images on screen while keeping real horses safe. The animatronic Joey, which was used in the No Man's Land scenes in War Horse. Photo by Pete Hawkins/Wired.co.uk. See video of the animatronic Joey before it had hair and details added. The video below has interviews with the horse handlers on the set of War Horse and mentions the production crew’s work with the American Humane Association.